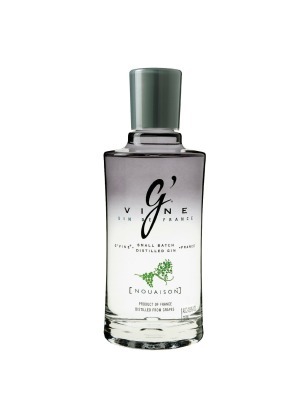 G'Vine Nouaison Small Batch French Gin is a popular Gin available from DrinkSupermarket.com in 70cl to buy online. Visit DrinkSupermarket.com for the best price for 70cl of G'Vine Nouaison Small Batch French Gin or compare prices on our other Gin products. After the blossoming period in June comes the setting (Nouaison in French), i.e. the birth of the berry. The fecundated vine flower forms a tiny green berry that fixes itself onto the stem. GVine Nouaison captures the emotion around this birth and its silver grey bottle embodies the unique and vibrant concentration of energy, intensity and spiciness of this phase. Tasting notes: Silky, intensely spicy, subtly floral. Nose: Round and warm, acutely botanical, viny, woodsy/forestlike, juniper and cassia bark. Palate: Fruity and rich. Intense and complex aromas of cinnamon bark, baked citrus, floral juniper follow through on a round, silky, zesty and robust entry. Very sharp and with a solid character. Finish: powerful interplay of juniper, herb, wood and flowery notes, fruity ripe, citrusy. G'Vine Nouaison amplifies the aromas of the spices, yet retains the sensual and silky grape base as well as the subtle floral note. Superb in a dry martini or in a cocktail, it is an absolute alternative to the classic London Dry gin. Where to buy G'Vine Nouaison Small Batch French Gin ? G'Vine Nouaison Small Batch French Gin Supermarkets & Stockists. You can buy G'Vine Nouaison Small Batch French Gin online in most retailers and find it in the Gin aisle in supermarkets but we found the best deals online for G'Vine Nouaison Small Batch French Gin in DrinkSupermarket.com, Amazon.co.uk, TheDrinkShop, and others. Compare the current price of G'Vine Nouaison Small Batch French Gin in 70cl size in the table of offers below. Simply click on the button to order G'Vine Nouaison Small Batch French Gin online now.